The Skinny: Sequel to the 1995 hit and the best of the Heisei Gamera series. Gamera fights insect-like alien invaders bent on populating the earth. 1995's Gamera: Guardian of the Universe was a hit, prompting the sequel Gamera: The Advent of Legion one year later. Ayako Fujitani returns as Asagi Kusanagi, the teen who bonds with Gamera. The film also stars Japanese soap star (and granddaughter to Toho Kaiju Eiga star Kumi Mizuno) Miki Mizuno, as a computer scientist who helps the military unravel the mysterious life cycle of earth's latest invader. This time out, the alien in question is called "Legion." Legion is a symbiotic organism comprised of thousands of little soldiers. Their job is to prepare the Earth for the growth of a deadly flower, which launches its seed with a destructive force equivalent to that of a thermonuclear device. There is also a Queen Legion who, much to Gamera's dismay, sports shooting rays and tendrils as well as a nifty force field. The military attempts to assuage Legion, but ther attempts are futile. It soon becomes evident that Earth will be overtaken by the Legion and the human race will cease to exist. Things begin to look even bleaker when Gamera is mortally wounded by a seed launch in one of the film's best special effects sequences. Our hero becomes literally a shell of his usual self until he is revived by Asagi and a group of children who bond with him mystically. The end battle in this, the best of the Heisei Gamera trilogy (so named for its production during the reign of the Japanese Emperor Heisei), is astounding. 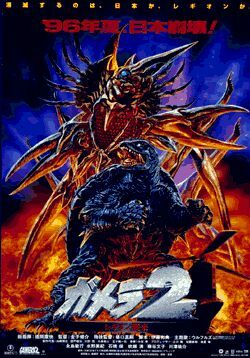 The suitmation is superb and Shusuke Kaneko, Shinji Higuchi and crew have bested themselves in creature design as well as execution of the action and drama.